The story: Beginning Sept. 1, Maker’s Mark began offering an uncut, unfiltered version of its bourbon for tasting during distillery tours and for purchase in the gift shop. They were kind enough to send me a sample, which I sipped side by side with Maker’s Mark’s Original Recipe, bottled at 90 proof. Here are my thoughts. 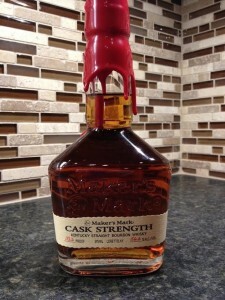 The aroma: As you would expect, the Cask Strength has a much bolder nose than the original. It’s less sweet – after nosing it, the original Maker’s smelled like molasses – and it burns. The taste: Again, much more heat than the original. The classic flavors of vanilla and brown sugar are there, but not as pronounced, along with more oak tannin and an afterburn in the finish, which is longer than the original’s. The verdict: During a tasting I attended a couple of years ago, Bill Samuels Jr. explained that in creating Maker’s Mark, his father, Bill Sr., was going for a sweeter, softer bourbon – a “bourbon that actually tastes good,” he said. He certainly achieved that with Maker’s, a well-balanced, well-rounded bourbon that is well-suited for those times when you want something really drinkable, if not too challenging. Some people complain that Maker’s is too sweet, and it does tend toward that end of the spectrum with its brown-sugar/vanilla notes – heck, I even bake with it. The Cask Strength unleashes the fire that the original Maker’s tempers by cutting the bottle proof to 90. It’s boisterous where original Maker’s is refined; to reference the wood in which they are aged, it’s a rough piece of lumber, where original Maker’s has been polished with a fine 600-grit sandpaper. The one you think is “best” will depend on your personal preference. In either case, in an era in which consumers are seeking new-new-new, this is a smart way for Maker’s Mark to offer something different, but not too different, from the bourbon it’s built its reputation on for more than 50 years. P.S. This post marks the photo debut of my remodeled kitchen. I may or may not have undertaken this project to have a more pleasing background for blog post images.